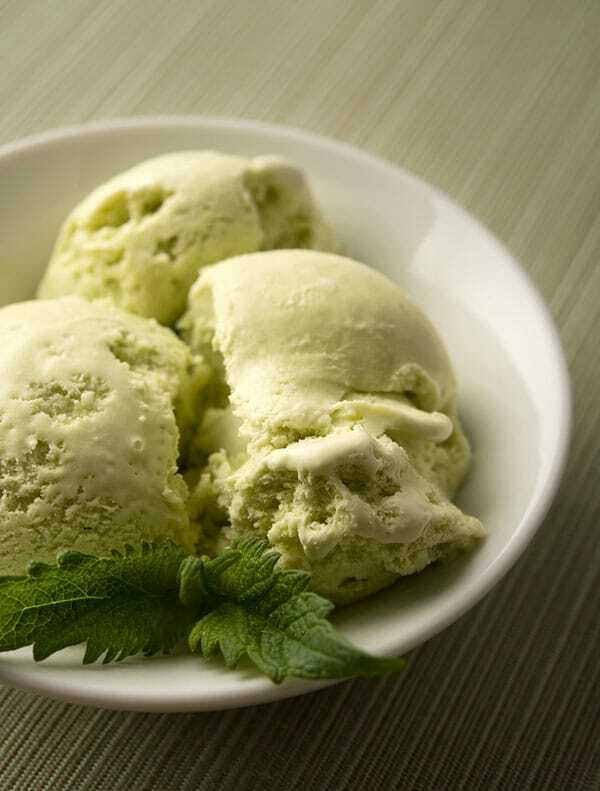 Fresh mint leaf ice cream sounds redundant, but it’s not. 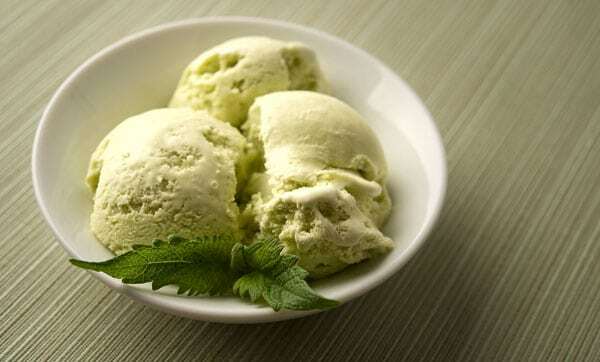 Most mint ice creams you eat are made with mint extract, not real mint. There is a reason for this, aside from the fact that it’s a helluva lot cheaper for a corporation to use extract than buy tons of mint. The reason is because extracts give you a pure mint flavor, which I find nice, but, well, shallow and rather one note. First, it’s a way to use up all that mint that has invaded your yard and is threatening your children. If you grow mint, you know what I am talking about. Second, you get a nicer color with the leaves, which lend some of their chlorophyll to the cream. If you use an extract, you need to use food dye to get that pretty celadon green. Third, you get to revel in the wildly variable world of mints. Mints are notoriously fickle, and will hybridize and morph grandly into sweet or spicy strains. Chocolate mint, anyone? And with wild mints, you have an even larger palette of flavors to work from. I used wild Sierra Nevada mint from about 6800 feet to make this batch, and it’s a very vegetal, green-tasting mint with a spicy overtone. Imagine a combination of mint and green tea and you get the idea. No need to go into terrific detail on how you should eat this ice cream. I like it by itself, or in a milkshake. Keep in mind that any mint — really any aromatic herb — works here. 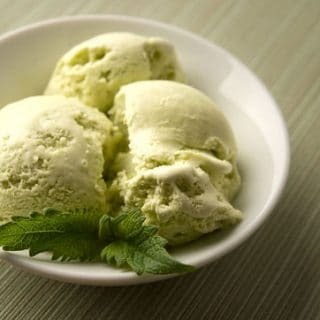 Spearmint, water mint, yerba buena, peppermint, young oregano, marjoram, lemon verbena, sweet Melissa, lavender and monarda are some of the herbs that would be nice in an ice cream. I am sure you can think of others. Can you make this with dried herbs? Yes, but the flavor will be slightly different, a bit less “green” and a bit more musty. Can you add chocolate chips? Yep. Do it right after you churn your ice cream, when it has the consistency of soft serve, so you can fold in the chips before you freeze the ice cream hard. I am indebted to my friend David Lebovitz for the method in this ice cream. He is a master ice cream maker, and his trick for leaving aside a cup of cream to quickly cool the hot custard really works well. Put the milk, salt, sugar and 1 cup of the heavy cream in a pot and heat over medium-low heat, stirring often, until everything combines. Add the mint leaves and stir to get them all wilted in the hot milk. Turn off the heat, cover the pot and let the milk return to room temperature. When it hits room temperature, chill overnight in the fridge. The next day, strain the mixture through a fine-meshed sieve. It's OK if a few tiny mint leaf specks get in there. Reheat the mixture over medium-low heat. Whisk the egg yolks in a bowl. In another bowl, pour in the other cup of heavy cream and set the fine-meshed strainer over it. When the mint-cream mixture is hot, about 150°F, you are ready to temper your eggs. With one hand whisking the eggs, slowly pour in a ladle of the hot cream. Do this three times total, whisking and pouring the whole way. Then pour the egg-cream mixture into the pot and stir to combine. Cook the mixture slowly, stirring often, until it thickens enough to coat the back of a spoon, about 160°F. Pour it through the strainer into the bowl with the other cup of heavy cream; doing it this way cools the mixture quickly. Chill everything down and churn according to your ice cream maker's directions. Note that prep time does not include the time it takes to churn or chill the ice cream. 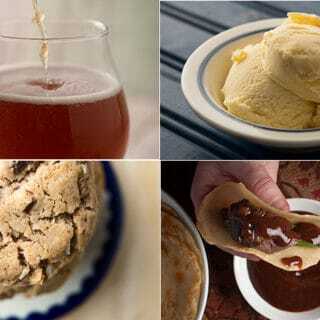 You can find all sorts of recipes for sweet things made with wild foods, right here on Hunter Angler Gardener Cook! Wow. This recipe is great. Best mint ice cream ever!